Gifts don’t just have to please the person receiving them. There’s a whole world out there that could be benefitting from the presents you buy. So if you’re shopping for someone who already has everything they could possibly need or is simply the altruistic type and happier receiving something charitable, consider some of the following ideas. Looking after a pet at home can be a huge responsibility. It can be extremely expensive, time consuming and often stressful. Besides all these reasons, there are enough cats, dogs and rabbits running about – what about the underdogs? (No pun intended). What about the giant pandas, black rhinos and king penguins? Who’s looking after them? 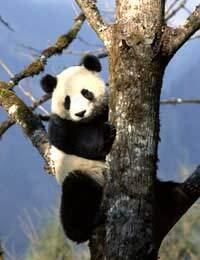 The panda is the rarest bear species on earth and lives primarily on bamboo in central and southern China. There are currently only about 1600 Giant Pandas left in the wild but with the help of a £2.50 a month donation, their environment can be conserved and the future of the species protected. Despite the obvious moral advantages of purchasing such a gift, it also includes a certificate, a print of the animal, facts about the species, a greetings card, tips on a 'greener' lifestyle, screensavers, and a soft, cuddly toy. Aww! The recipient will also receive quarterly updates of their animal’s progress. The greatest threat facing rhinos today is the demand for their horns, which are used in traditional Chinese medicine, and traded illegally. A small donation a month helps support the enforcement of appropriate wildlife trade laws, and help to develop these laws where they do not yet exist. There are less than 500 black rhinos left in Kenya. Volunteer Point on the Falkland Islands is currently home to 1200 adult king penguins with 345 chicks and is one of the most popular tourist attractions in the Falklands, with over 1000 tourists visiting a year. Your donation will go towards preventing undue disturbance of the birds, as well as towards research programmes needed to support and monitor the diet of Falkland penguins, their population and breeding success. You know you ought to! If you’d prefer a more direct way of saving the natural world and its environments, there are many other charitable gifts available. Adopting an animal cannot positively ensure the survival of its species. However, you could positively ensure the survival of many species’ habitat. An Acre of Rainforest - For as little as £25 you can enable the World Land Trust to purchase and protect one acre of critically threatened rainforest in Ecuador which will then become part of one of their reserves. The plot of land will then be protected forever against deforestation and other threats and providing you aren’t afraid of torrential rain or being fondled by monkeys, you are free to visit and stay whenever you please. No, not a vital organ. But if helping people rather than animals is more your thing, there are plenty of gifts that will help out those less fortunate than ourselves. A sheep, goat or chicken - This gift gives you the chance to do something really quite amazing with your money. For the same price as a few days worth of shopping you could pay for a sheep, a goat, or a brood of chickens for a poor African farmer, struggling to feed his family. It may not sound like a huge amount, but a goat can provide milk for years, which can not only feed a family, but be sold in order to buy other important provisions. The recipient will receive a pack including a miniature model of a sheep, goat or chicken, more information on how the real animals are helping poor farmers in Africa and most importantly, the knowledge that they are making a huge difference for someone who could really do with their help.